Preview Clip see the Download page. 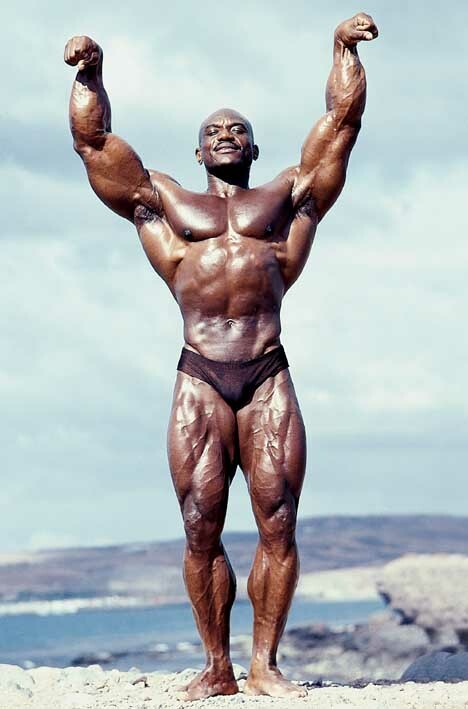 SERGIO OLIVA – “The Myth” : 3 TIME MR. OLYMPIA - 1967, 1968 & 1969. Sergio Oliva "The Myth" is without doubt one of the greatest bodybuilders of all time. This DVD is our tribute to the life and fantastic career of Sergio Oliva, 3 time Mr Olympia and a living legend of the sport. This is probably the most significant historical DVD we have ever offered. 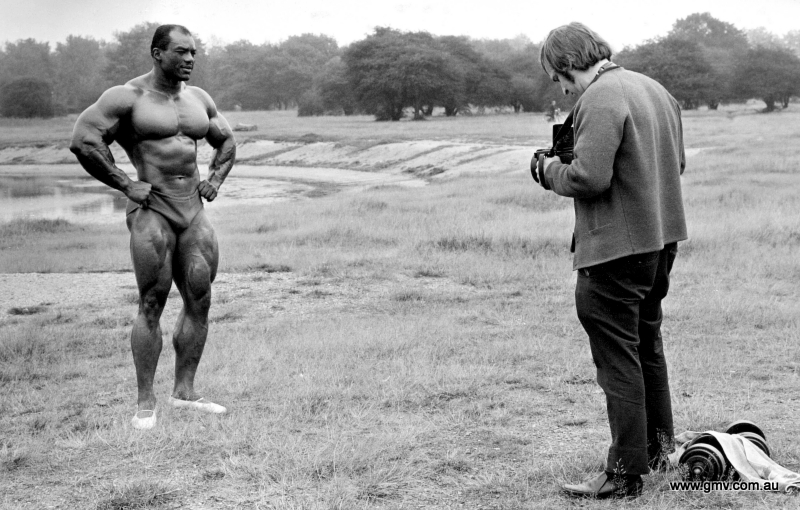 This historic footage was shot by Wayne on Wanstead Heath, in London, 2 days after the 1972 Mr Olympia where Sergio narrowly lost to Arnold in Essen, Germany. The action depicted in this sequence is said by many to be the greatest ever pumping and posing footage to be captured outdoors on film, showing a Mr Olympia title holder in absolute top contest condition. Sergio oiled up, pumped up with dumbells then posed his heart out for the camera, delivering a virtuoso posing rendition of his Mr Olympia posing routine. This was then topped off with bodypart posing in closeup. In particular the posing of Sergio's arms was awesome to behold. Complete with the famous "Myth" arms up in the air pose. While Wayne was busy filming, famous gym owner and long time friend Wag Bennett was snapping away for Wayne, getting photos to record this historic film shoot for posterity. You will see some of these photos in the DVD's Photo Gallery. Wag also shot the photo of Wayne taking photos of Sergio with the big old Mamiya RB67 still camera affectionately known as "The Tank"! You can see this photo below, and also on the rear cover (above) of the Sergio DVD. All B&W photos on this page copyright Wayne Gallasch. To see the complete 1972 Mr Olympia footage from Essen, it is contained in the DVD "Arnold the Early Years". Please click here for GMV-250DVD. Once again this footage was shot by Wayne, this time on the day after Sergio won the Pro Class of the 1977 WABBA World Championships. This classic men's contest was staged by Serge Nubret in Paris, where Sergio had guest posed at the Nubret's promoted Mr Olympia event 6 years earlier. Sergio's 1971 Olympia guest posing is included in this DVD. The popular GMV shooting formula was used again at pool-side with Sergio first of all oiling and pumping up before launching into his classic, winning posing routine. In this segment Sergio is assisted in his pumping up by Miss Olympus Lynde Johnson who willingly obliged by sitting on his back while he did pushups! At the end of the posing routine segment, Sergio again gave us some mind blowing closeup posing of various bodyparts for Wayne's super 8 film camera. It was late in the year and freezing cold at poolside, but Sergio still went through with it, with Lynde helping to keep him warm. After the usual posing for photos, which you can see in the Photo Gallery, the filming session was all over far too quickly due to it becoming freezing cold at pool-side! As far as we know, these were the only 2 professional outdoor film posing sessions ever shot with Sergio during his long and incredible career. To see the complete contest DVD from the 1977 WABBA Worlds, please click here for GMV-049DVD. Also in V-128 there was a beach pumping and posing segment by Mr America Manuel Perry. This segment to be used in a future Classic Collection DVD compilation. My sincere thanks to all of the people who contributed footage and photos to make this a fitting tribute to SERGIO OLIVA, truly one of the greatest bodybuilders who ever lived. The Myth is no longer a myth to all who may have not seen him. He now is a reality and is preserved for all to enjoy on DVD. All the many contributors are thanked in the end credits of the DVD. The 1972 Sergio footage was previously part of my VHS video V-115 with Frank Zane. This Sergio footage is now the key part of the above DVD. The FRANK ZANE outdoor posing from VHS video V-115 is now the key part of my in-depth DVD on Frank Zane - Physical Perfection. See below. The 1973 Guest Posing at the WBBG Mr America/Mr World is incorrectly captioned on screen as 1971 Mr Olympia Guest Posing in the segment shot from left of center. Special thanks to Tom Caterino for providing some of these historic segments. **For Wayne's HARD NEWS REPORT on the background behind the shooting of this DVD, please click here. 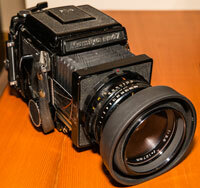 To see more details about this classic MAMIYA RB67 camera used on the Sergio shoot (see photo above) and on other classic shoots with Arnold, Frank Zane, Mike Mentzer and many more champions, please click here for some interesting details. Extras: Photo Gallery. 54 photos, many of them unpublished photos shot by Wayne. Photos: Front cover photo by Artie Zeller. Other photos by Wayne Gallasch and Wag Bennett. Click here to see Sergio's complete contest history. Click here to read John Hansen's review of this DVD. To see Sergio's great rival Arnold in "Arnold - The Early Years", please click here for GMV-250DVD. July 4, 1941 - November 12, 2012. It is with great sadness that I report the passing of Sergio Oliva. Universally known as “The Myth”, Sergio won three consecutive Mr. Olympia titles from 1967-1969. His great rivalry with Arnold Schwarzenegger will go down as probably the greatest rivalry in the history of bodybuilding. See my PERSONAL TRIBUTE TO SERGIO OLIVA here with my first and last photos of him. This is just a quick note to tell you that the Sergio DVD arrived today. I viewed the entire work this evening. You did a masterful job! Thanks again and congratulations on a job very well done! John Corlett. "This DVD has been over 12 months in the planning and making and will be my tribute to his life in bodybuilding. Sergio is probably the most genetically gifted and totally amazing bodybuilder I have ever seen in all my 42 years of shooting top bodybuilders." Wayne Gallasch, April 2008.